Time to justify monster slaughter with cool outfits. Monster Hunter: World has been out for nearly a week now, so it's time to show off the product of all that strenuous wyvern murder. 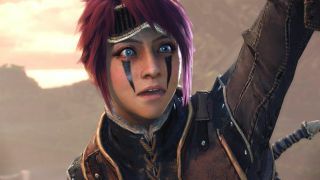 Share a picture of your monster hunters (and palicos, of course) in the comments, and tell us a little about them. The best way to grab an image that really expresses why you hunt is to snap a pic of your guild card. Like most of World's features, the guild card is buried in menus and, to my knowledge, not tutorialized. If you've yet to capture your character and palico, put on your best digs, strike a pose, and take a screenshot. But if you have an excellent kill screen that also flatters your cool outfit, feel free to share that instead. Here's what I'm rolling with, right now. I'm grinding out the Diablos switch axe tree, and desperately looking for an Anjanath gem. I've ruined so many of those chicken-winged tyrannosaurs with no luck. I don't even need the set anymore, I just feel compelled to complete it. I must complete it. I based my character on my partner, because she likes to see how badly I screw up her likeness, but I've given her some corpse paint to reflect my affection for dreary metal. Chuck, my palico, is based on Chuck, my actual cat. A bit hard to see behind that Uragaan armor.